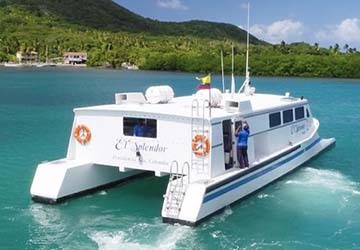 Conocemos Navegando operates crossings within the beautiful Colombian archipelago of San Andrés, Providencia and Santa Catalina off the east coast of Nicaragua, with day trips also provided to the islet of Cayo Bolivar. The company originally began as a private businessman’s venture but has since developed into a popular local ferry operator. The first catamaran of the fleet was built in 2009 and continues to provide an excellent service today. Conocemos Navegando’s fleet consists of 2 top-quality catamarans which both offer safe, fast and enjoyable sailing experiences. Aboard the vessels, you’ll find fully air-conditioned seating areas, superb amenities and unbeatable views of the archipelago. ‘El Sensation’ can accommodate 65 passengers, while ‘El Splendor’ boasts 405HP twin engines and a capacity for 71 passengers. The cruise also gives passengers a great opportunity to spot colourful marine life amongst the 3rd longest barrier reef in the world, which reaches around 32 kilometres. Direct Ferries provides a ferry timetable and price comparison, based on your search criteria, allowing you to compare Conocemos Navegando products with multiple ferry company timetables and fares in one search. Compare Conocemos Navegando timetables and prices now with all alternative ferry operators before booking your ferry ticket to ensure you get the best option for your ferry trip.